For those of you who’ve been asking, I think the best way to keep up with the Hayabusa2 mission to asteroid Ryugu is via Twitter, @haya2e_jaxa. The news continues to percolate via websites and various publications, with a sustained ripple when the spacecraft successfully tested its sample mechanism and touched down on the asteroid. I’ll remind you too that the mission team now offers updated systems information in English on its Haya2NOW page for obsessives like me who want a really fine-grained look at what’s going on. ・Projectile was command to fire. and photos like the one below, which was sent out to thank worldwide supporters for their thoughts and encouragement. Look at the size of the Hayabusa2 team! Congratulations to all of you. Upon touchdown within the 6-meter circle selected on the asteroid, the spacecraft fired a tantalum ‘bullet’ into the surface to drive particles outward that the sampling instrument could collect. The craft then rose again, as vividly attested in the photo below, where its shadow is obvious. Two more samples are to be taken before Hayabusa 2 departs the asteroid, the final sampling involving a larger crater deliberately blasted into the asteroid to probe sub-surface materials. You may recall that the original first sample collection was scheduled for last October, but had to be delayed because the surface of the asteroid turned out to be rougher than expected. 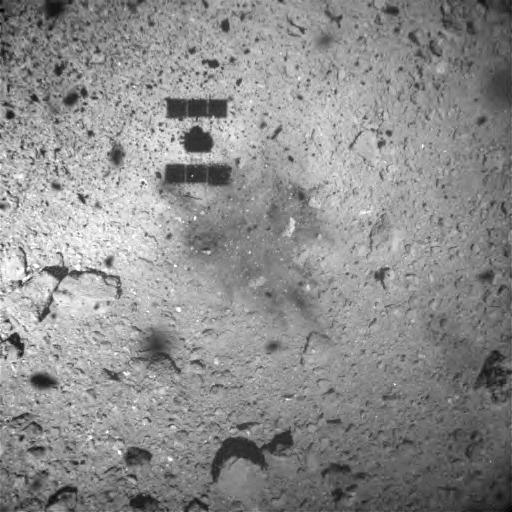 JAXA has been operating two small robotic rovers — MASCOT and MINERVA-II — on the surface, which produced the information that centimeter-sized gravel and larger were to be found there. As the agency reported online, a key question was whether the material was fine enough be released from the asteroid during the sampling events planned, which is why an artificial gravel experiment was performed in Tokyo at the end of December. Image: Target simulating the surface of Ryugu (Credit: JAXA, University of Tokyo). In the ground test performed during the initial development, even large rocks with similar strengths to carbonaceous chondrite meteorites were crushed when a projectile made of metal (tantalum) with a mass of 5g was injected at about 300 m/s. It was confirmed that material formed from the resulting small pieces could be gathered by the sampler. So in this test, it was predictable that the bullet would crush material that it struck, but what would be the behavior of the gravel surrounding the focus of the shot? From the results of the experiment, the fragments of gravel that were crushed were released into the surrounding gravel where they collided like billiards to break up the material. The resulting sample amount exceeded the initial assumption that would be released from the surface (Figure 4). While the diameter of the collision site (crater) made by the impact of the projectile is smaller than when compared to that in a fine regolith layer, it was a sufficient size in comparison with the inner diameter of the open tip of the sampler horn. The plan is for Hayabusa2 to depart Ryugu in December of this year, with return to Earth toward the end of 2020. 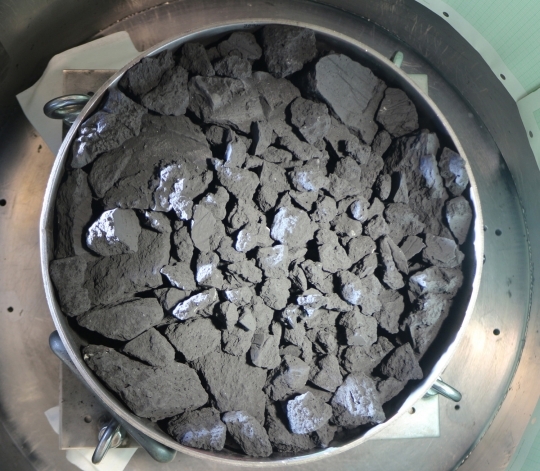 Assuming a successful sample return, Hayabusa2 will mark the first time samples from a C-type (carbonaceous) asteroid — the most common, constituting 75% of those known — have been returned to Earth. Naturally we’ll also keep an eye on OSIRIS-REx and its operations at 101955 Bennu, another carbonaceous asteroid, for both sample returns should give us a window into early building blocks of our planet. The OSIRIS-REx sample return is scheduled for 2023. 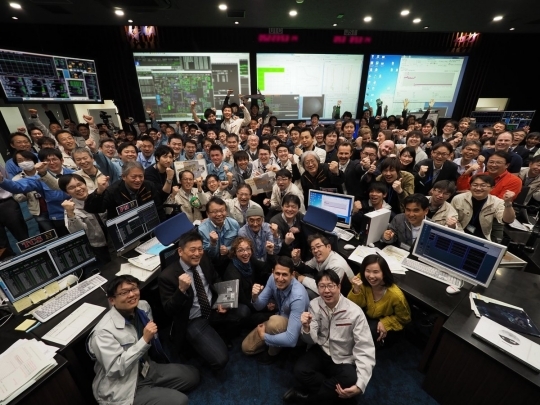 Very professional, thoughtful, and most importantly patient work by JAXA. Great job! What I am not reading is whether the sample collection was actually successful. Is this unknown until arrival at Earth’s labs? Tangentially, and a little OT, I keep seeing [click bait?] stories about how this will both help determine “the origin of life” and further “asteroid mining”. Neither of these seems like a likely result of the sample analysis. This document Hayabusa 2 Information Fact Sheet seems to have some good details of the science objectives (starting on page 124). The science objectives include elucidating planetary formation in the solar system. That might shed light on the various models I read about in various CD posts, including the latest on Al26 and water worlds vs “dry” worlds. I’d call your click bait surmise to be spot on Alex. It is not the first time, the Mars rovers were described as searching for life on Mars in popular press. And there’s other examples as well. This is not only bad for space science as such, as it could be interpreted that the mission is a failure by the politician or paper weight in the department who allocate funds for the next mission. But also for the conspiracy crowd out there who constantly yell and warble on Youtube about ‘secrets’ and conspiracies on Mars and other locations in the solar system. Such idiocy cannot be at least mitigated if the mission goals would be described correctly, so there’s no false expectations. Over my lifetime, the dumbed down science journalism and growth of anti-science leave me a little depressed. For example, when I was young, Scientific American was a serious magazine. When Rennie took over, it was dumbed down to compete with fluffy mags like Popular Science. It has never recovered. I get that in a world of advertising-supported media, attention is a fairly fixed resource, and media are increasingly competing with that attention, but almost every outlet is trying the same strategy, just as the mainstream US tv companies did when competing with the many offerings on cable. Personally, I find CD a haven of quality, accompanied by and large, with good, thoughtful comments. Scientific American – serious(ly) dumbed down science magazine. Viking was explicitly designed to search for life on Mars. When it seemed to have failed to meet 1970s expectations on what was supposed to be living there on the Red Planet – plus it had a 60 million dollar biology lab aboard both landers – many saw the Viking project as a failure, even though they exceeded in so many other ways. That was one reason the US did not send another lander to Mars for over two decades. The anti-science propaganda and lobbying do not only worry me a little – but very much. A political correctness culture spreading where it is forbidden to tell the delusional person that the Earth is round, that there is no bones or machine parts on Mars, or that the effect on CO2 on climate were proven more than 100 years ago. @ljk: Yes the Viking is the only successful mission looking for life elsewhere – and only second attempt. Beagle the other and failed at landing. Viking could be another example where boosted expectation for a mission could cause a backlash. At that time there were no Internet with rumor spreaders, now there are such attention seekers making wild claims it is even more important that the media report correctly. I’m eager to see the analysis when the samples are returned, as I’m among the minority who sees mankind’s spacefaring future as one built with asteroidal material, where we celebrate our liberation from gravity wells. I cheer on you guys urgently searching and hoping for earthlike planets, but I expect our descendants will still be carrying on their searches from Island 3’s and hollowed-out asteroids 500 years from now. Oh, we already found an Earthlike planet long ago. It’s called Mars. Your descendants on Island 3 will probably eat food imported from there. When we colonize Mars we will likely be on other worlds as well, including floating space structures ala O’Neil colonies. Will they be able to make a living by exporting unique goods, or will these colonies be largely self-sustaining? Maybe they can make money from tourism. Looking at the image, there seems to be dark splotches further away from the dark area where it landed. Theses could be dust blown up onto the camera lens when it landed or maybe carbon rocks eject from the blast from the landing. The rocks may of dissolved and left carbon dust when they impacted. If there are more images you could tell if they change position, then you can see it was on the camera lens. What if we learned an asteroid was headed toward Earth? How much energy does it take to destroy an asteroid and break it into pieces? More than we thought, it turns out. Hayabusa2 scored a near-perfect bulls-eye during its touchdown on Ryugu in February, according to a 5 March press briefing by JAXA officials. The mission is gearing up for more action-packed operations that include using explosives and a copper projectile to create a crater, and a possible second sample collection after that. I’ve been asked a couple times if any of that debris escaped Ryugu’s gravity entirely. The answer is: we don’t know yet! The Hayabusa2 team is still looking at this. Ryugu’s escape velocity is a mere 38 centimeters per second—0.85 miles per hour, to put it in U.S. driving terms, or the walking speed of a penguin, to put it in penguin terms. The debris isn’t moving quite as fast as it appears in the video; the frame rate varies between 0.2 and 2 frames per second, and the video compresses 340 seconds of action down to barely a minute. Can anyone explain why these sample return spacecraft have to use such complicated systems to obtain a sample of surface material? Why fire impactors to blast microscopic fragments to be caught in fine aerogels? Why not just extend a robotic claw, and grab a handful of dust and rock? What a great week in Houston! With three missions reporting first science results, the celebration of the 50th anniversary of the Apollo 11 landing, and a host of ongoing science from across the solar system, it was intense and fun. For me, the most exciting results were the back-to-back sessions reporting on first looks at Bennu and Ryugu with OSIRIS-REx and Hayabusa2. Jason has already reported out OSIRIS-REx results, so I’ll tell you what the Hayabusa2 team had to say. If you enjoyed the drama of Hayabusa2’s sample collection touchdown, get ready for an even bigger fireworks display. The spacecraft is about to deploy an explosives-filled box that will detonate in space, fire a copper plate into Ryugu, and create a crater up to 10 meters wide. The moment of crater generation is set for 5 April at 02:36 UTC. Here’s what to expect.